I am in Cape Cod today, on vacation with my husband’s extended family. Yesterday it was my turn to make dinner, and I envisioned a gorgeous piece of broiled bluefish. I made the fatal mistake of sharing this vision with my in-laws. When I suggested shrimp or scallops, my niece Katy made a barfing sound. Cousin Noah let it be known that hates halibut and Suzie is sick of sole. Bette said flounder was too boring, and octopus was a non-starter since Uncle Johnny won’t eat things with more than four legs. Aunt Sue won’t eat squid, having been traumatized by “20,000 Leagues Under The Sea” as a child. “Ew. Bottom-feeders,” said my daughter Nora. “Oysters!” I shrieked. “This is the land of oysters! Go with it!” In my desperation I’d temporarily forgotten my allergy to them. Eventually it was agreed that I’d make swordfish, but by the time I got to the fish market, it was sold out. (Maybe there is a Picky Family Convention in town.) So, I gave up on seafood and made chicken. Bu from now on, when I am planning a menu for the family, it’s going to be Don’t Ask, Don’t Tell. If they don’t like what I serve, let ’em eat hedgehog. P.S. 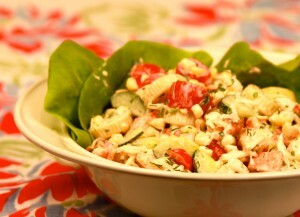 Another thing I would have loved to make while on the Cape is one of my favorite summer recipes–lobster salad–but my husband Tom won’t eat lobster Julie won’t eat tomatoes, Will won’t eat cucumbers, and a couple of family carbo-phobes won’t eat corn or pasta. But I will share the recipe with you, so you can make it for your family. I hope they are a more tolerant bunch than mine. 1. Cook the pasta in salted boiling water, adding a splash of olive oil to the water to keep the pasta from sticking together. Cook pasta until al dente (tender), about ten minutes. Drain the pasta and set it aside to col.
2. Add about two inches of fresh water to the pasta pot and bring it to a boil. Add the corn and cook for just two minutes. Drain the corn and set it aside to cool. 3. In a medium bowl, combine the mayonnaise, sour cream, lemon juice, salt and pepper. Set the dressing aside. 4. Cut the lobster into bite-size chunks and place it in a large bowl. Scrape the corn kernels from the cobs and add them to the bowl. Halve the grape tomatoes and add them to the bowl. Cut the cucumber in half lengthwise. Scoop out the seeds with a spoon. Cut the cucumber halves in half lengthwise and then cut into ¼ inch slices and add to the bowl. 5. Add the chopped herbs and the pasta to the bowl and toss the salad, adding enough dressing to lightly coat all the ingredients. Serve immediately, or chill for a few hours and serve it later. This entry was posted on Thursday, August 4th, 2011 at 12:34 pm	and is filed under Go Fish, Pasta A Million Ways, Salad Days. You can follow any responses to this entry through the RSS 2.0 feed. You can leave a response, or trackback from your own site. Please come to our next family reunion. We all eat everything. You are a national treasure and your family doesn’t deserve you! Off the top of my head I couldn’t even name that many fish, much less cook them. Let them eat hedgehogs! I wanted to say thank you Jessica. I grew up cooking in the south. 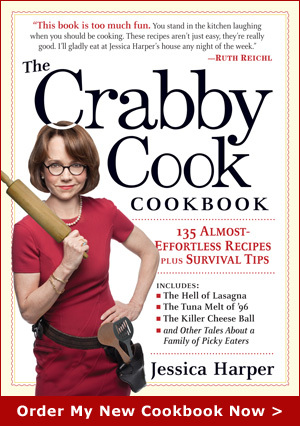 I thought I liked to cook then I moved to LA where I learned I was actually a crabby cook. Recently my brother came to visit and I was in a panic of how to feed him. I think he was concerned about what he was going to eat knowing that I had quit cooking. I was saved by your cookbook. I prepared the roast pork and hot slaw to name a few. All of which were wonderful and easy. My brother was happy and relieved because he will be coming to stay with me for a month. I am not worried now because I plan to work my way through your entire cook book. You are my savior. So keep the recipes coming. Can’t wait to try the lobster salad. great Lobster salad recipe! I will try it before Summer ends. Also? I too am just back from New England, 3 states in 8 days, whew, visiting my little brother and my god daughter and godson and made them a pretty sweet lobster risotto ( if I do say so myself ) but I TOO as did you have to deal with SO many food complainers and my family up there is all Italian and French so you’d think no complaints but OH YES so many eyes peering over my shoulders as I cooked as if I was putting eye of newt into the pans and bowls, at least my 5 year niece thinks it is magic and was very helpful as I cooked, really.